Three things to keep in mind before you start selecting your treatments are the level of privacy you want for the space, the light the room gets, and your budget for the space. 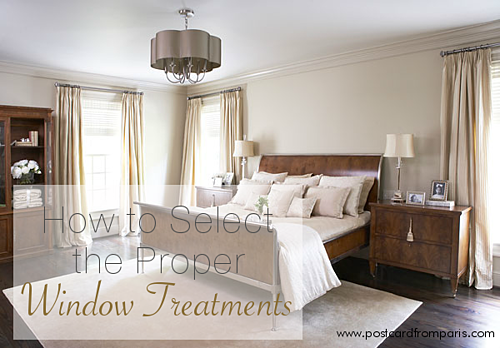 Be sure to check the rooms out at different times of day when you are selecting the treatment because you might need to block light from streetlights or car headlights on top of filtering sunlight in the room. Treatments that can change the level of privacy and light in a space can be the difference between a livable room and one you avoid altogether. Here's a breakdown of various categories of window treatments and suggestions for when it's best to use each. Panels: These are also referred to as drapes or curtains and can transform a room in a heartbeat. These can be functioning, meaning there is enough material for these to close completely to provide privacy and to block light. Or, they can be non-functioning, meaning they are strictly for decorative purposes. The best time to use panels is if you are looking to spruce up a space but do not need privacy or light filtration. They are also a great tool to draw your eye up in a room, especially if you have low ceilings. Roman Shades: These crisp shades are made from fabric and are made to fit the window just so. They are operated by a pulley system that can be raised or lowered as necessary. Many retailers make ready-made shades to fit standard sized windows or you can have them custom-made with the fabric of your choice. Romans are best used in rooms that need privacy or light control but where you would still like to use fabric as opposed to another material. Woven/Roll Shades: These are an alternative to the typical shades or blinds you see in most homes but offer the same benefits of privacy and light filtration. Since these are made from woven material, you can control the opacity of the shades. When left unlined, they let in some light; when lined, they can offer privacy or blackout capabilities depending on your needs. Woven shades can add a lot of personality and texture to a room so these are great alternatives to standard blinds if you are looking for a way to dress them up. Wood Blinds: One of the most recognizable window treatments, wood blinds have been around for so long for a reason. Offered in a variety of wood species and finishes, these can easily match any decor. These blinds also offer a varying degree of light filtration depending on the angle of the slats and can offer privacy when completely closed. Wood blinds are good choices for bedrooms or bathrooms that need privacy or light control but where you do not want to invest in fabric alternatives. Plantation Shutters: Similar to wood blinds, these are essentially shutters intended for indoor use. They are mounted to the window casing, so there is no "one size fits all option." They must be customized to specifically fit your windows. These are louvered to filter the light or can be opened completely to let in unfiltered light. Plantations are a great way to dress up a room, but it is important to keep in mind that if installing shutters in a room on the front of the house, you will want to keep all of the windows consistent. The same rule applies to wood blinds. Valance: This term is used to describe a multitude of window treatment "toppers." Most often it is used for a piece of material that is hung or mounted above the window to add softness and or to disguise other window hardware. These can be designed to look loose and flowing or very structured depending on the style you choose. Valances are an effective way to add color or texture to a window that doesn't have space for panels. They are also a wallet-friendly way to showoff your favorite fabric. Cornice: Similar to a valence (and the terms are often used interchangeably), this is an architectural detail that covers the top of a window. It is often made up of a structural component (e.g. wood, metal, etc.) and can be upholstered or left as is. You can combine a cornice with any of the other types of window treatments discussed above since it protrudes from the wall once mounted. Cornices can be a very beautiful architectural detail that breathes life into a room. Since these are typically large and heavy, it is probably best to limit these to more formal areas such as a great room or dining room. Which style do you like the best? 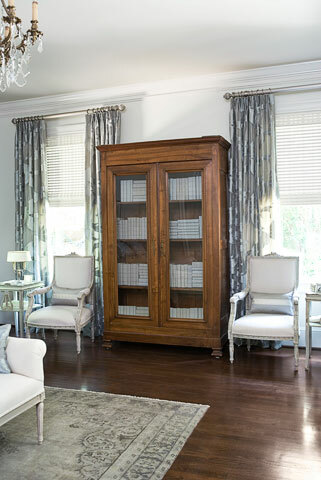 What questions do you have about window treatments? Click the button below for tips on how to handle some of the trickier window issues.